The 3 figures on this page introduce an ongoing project to support research and public discussion about New York City's Stop & Frisk Program. This first figure provides a new view of New York City's Stop & Frisk Program from 2006-2015. Color indicates race. 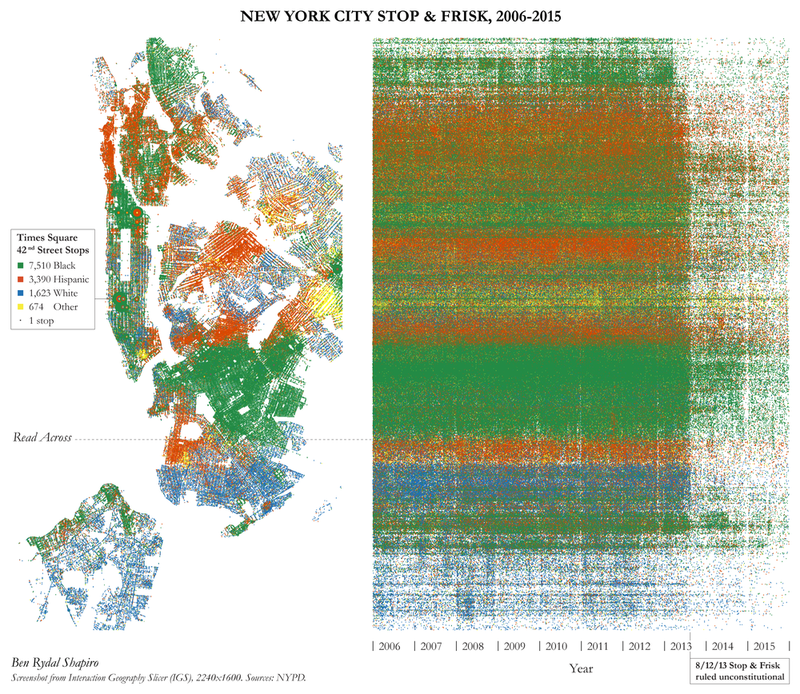 The left of the figure shows all recorded stops from 2006-2015 on a map of New York City. For example, the distribution of stops at Times Square 42nd Street Station is highlighted. The right of the figure or space-time view extends stops on the map horizontally over time. Together, both views reveal phenomena such as the intensity and uneven racial distribution of stops particularly near many subway stations in Manhattan as well as the dramatic fall in stops after the program was ruled unconstitutional on August, 12th 2013. Like any static figure, the figure also hides other phenomena. This 2nd figure shows New York City felonies at the same scales and dot conventions as stops shown in the 1st figure. The distribution of Felonies at Macy’s Herald Square is highlighted on the map view. One primary goal of the figure made visible by the right of the figure or space-time view is to show that felonies have remained relatively consistent from 2006-2015 in comparison to stops shown in Figure 1. This provides a stark and vivid contrast to those who predicted and still claim that felonies have risen dramatically since stop and frisk was ruled unconstitutional in New York City. This does not mean that stop and frisk is having no effect on reported felonies (e.g., felonies have decreased slightly over these 10 years). However, it supports existing research showing that stop and frisk policing practices may not influence crime in a direct or cause-and-effect way. This 3rd figure highlights stops and murders along Broadway Street, one of the oldest North-South thoroughfares in Manhattan, New York City. The figure is primarily meant to inspire discussion about questions such as how policing activity responds to violent crime differently in different neighborhoods and to further illustrate how each of the three figures shown here is created using a dynamic, visualization environment I have developed and call the Interaction Geography Slicer (IGS), which provides new ways to view, interact with and study large scale data sets over space and time. Shapiro, B.R. & Pearman II, Francis A. (2017). Using the Interaction Geography Slicer to Visualize New York City Stop & Frisk. In Proceedings of the IEEE VIS 2017 Arts Program, VISAP’17. Phoenix, AZ. This ongoing project is made possible by the National Science Foundation & Vanderbilt University's Space, Learning & Mobility Lab.